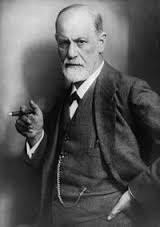 "Jewish Pink Elephant" by Rich Dweck: In 1935- "Sigmund Freud: Letter to a Mother of a Homosexual"
In 1935- "Sigmund Freud: Letter to a Mother of a Homosexual"
In 1935, the father of psychoanalysis, Sigmund Freud, was contacted by a worried mother who was seeking treatment for her son's apparent homosexuality. Freud, who believed that all humans are attracted to both sexes in some capacity, responded with the following letter of advice. I gather from your letter that your son is a homosexual. I am most impressed by the fact that you do not mention this term yourself in your information about him. May I question you, why do you avoid it? Homosexuality is assuredly no advantage, but it is nothing to be ashamed of, no vice, no degradation, it cannot be classified as an illness; we consider it to be a variation of the sexual function produced by certain arrest of sexual development. Many highly respectable individuals of ancient and modern times have been homosexuals, several of the greatest among them (Plato, Michelangelo, Leonardo da Vinci, etc.). It is a great injustice to persecute homosexuality as a crime, and cruelty too. If you do not believe me, read the books of Havelock Ellis. By asking me if I a help, you mean, I suppose, if I can abolish homosexuality and make normal heterosexuality take its place. The answer is, in a general way, we cannot promise to achieve it. In a certain number of cases we succeed in developing the blighted germs of heterosexual tendencies which are present in every homosexual, in the majority of cases it is no more possible. It is a question of the quality and the age of the individual. The result of the treatment cannot be predicted. What analysis can do for your son runs in a different line. If he is unhappy, neurotic, torn by conflicts, inhibited in his social life, analysis may bring him harmony, peace of mind, full efficiency, whether he remains a homosexual or gets changed. If you make up your mind that he should have analysis with me (I don't expect you will!!) he has to come over to Vienna. I have no intention of leaving here. However, don't neglect to give me your answer. Freud, Sigmund, "Letter to an American mother", American Journal of Psychiatry, 107 (1951): p. 787.